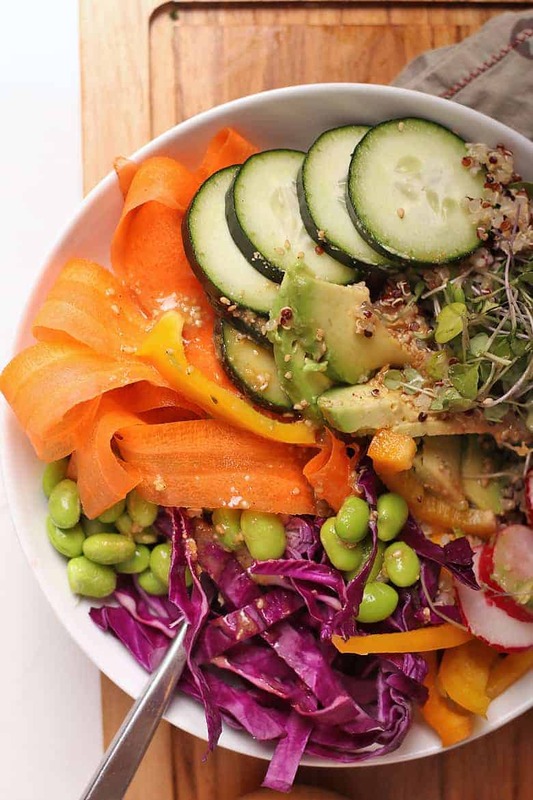 Brighten up with this Rainbow Buddha Bowl. 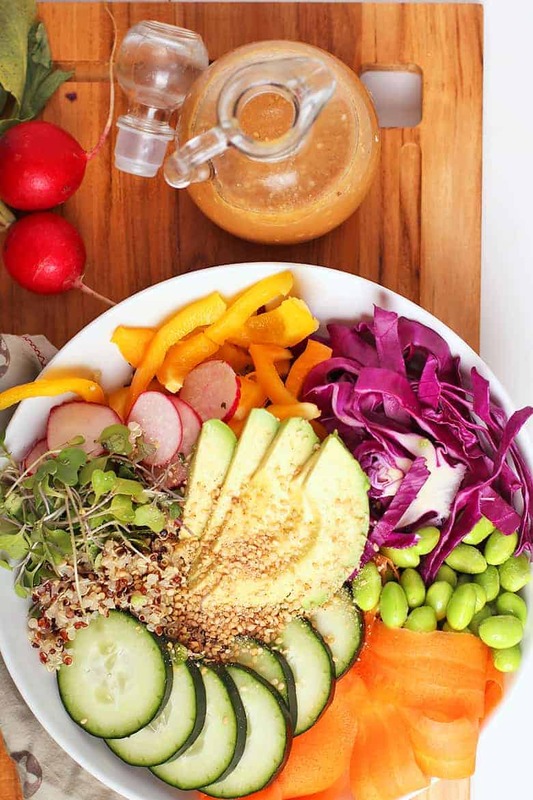 Made with a base of quinoa, filled with vibrantly colored vegetables, and tossed in a Sesame Miso Dressing, this Buddha Bowl makes the perfect light and refreshing meal. It’s day 23 of the 30 Day Cleanse. How’s everyone doing? I’ll be honest – I’ve caved a few times over the past 3 weeks but for the most part, I have been enjoying vegetable-packed, whole food meals and I’m feeling great! This beautiful nourish bowl is filled with Asian inspired flavors for a meal that is full of color, texture, and taste. Since I first made it, I’ve been eating it at least 2-3 times a week and I think you’re going to love it! But let’s back up a minute. First of all, some of you may be asking, “What is a Buddha Bowl?”. A Buddha Bowl, or Nourish Bowl, is a one-bowl meal filled to the brim with vibrant colors, wholesome vegetables, and plant-based proteins. The idea behind the Buddha Bowl is one of balance. The meal combines healthful foods that vary in flavor, texture, and health benefits to reflects the balance sought after in Buddhism. The term has been adopted and adapted so that it now strays from its origins. 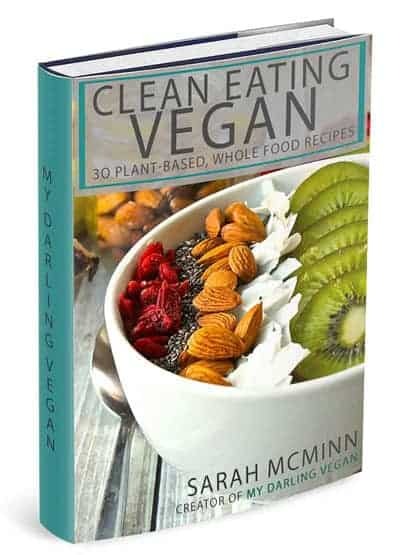 You can now find Buddha Bowl recipes that contain animal proteins such as lean meats or boiled eggs. Sadly, we can no longer assume that all Buddha Bowls offer a one-bowl vegan meal. Of course, this beautiful bowl filled with rainbow vegetables is 100% vegan, gluten-free, and refined sugar-free! While the term might be a bit vague now as it’s been liberally adapted, there are still guidelines to perfecting the Buddha Bowl. Let’s take a look at the several key components to the Buddha Bowl. Grain – Although this isn’t wholly necessary, most buddha bowls start with a base of healthy grains. The grains can be brown rice, quinoa, couscous, rice noodles, etc. Grains provide protein, fiber, and healthy carbs while bulking up the bowl with hearty and wholesome calories. Protein – A second component of the perfect Buddha Bowl is a plant-based protein. Proteins can often be in the form of tofu or tempeh. However, if you are looking for soy-free options, consider adding beans, lentils, or protein-rich vegetables into your dish. Vegetables and herbs – A variety of vegetables make up the bulk of a good Buddha Bowl. You will often find sautéed or roasted vegetables alongside crunchy vegetables (like cabbage or slaw) and dark leafy greens. 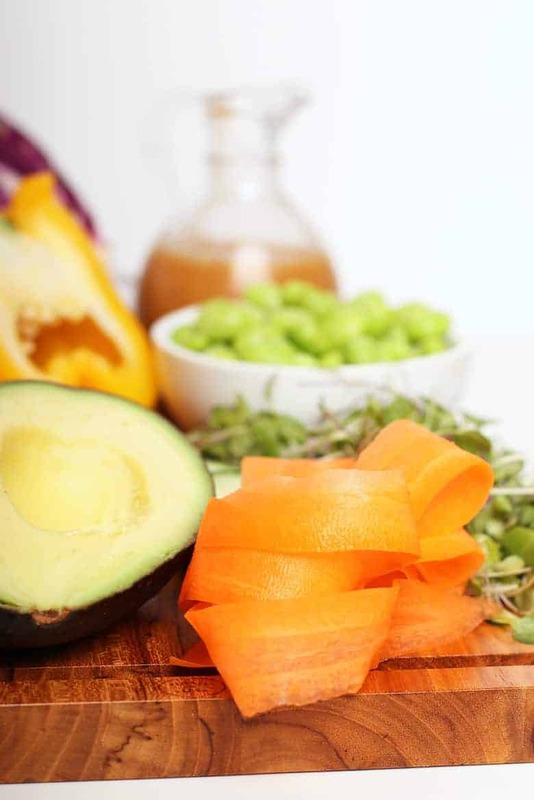 A mixture of vegetables offers a ton of flavor and a variety of major health benefits. 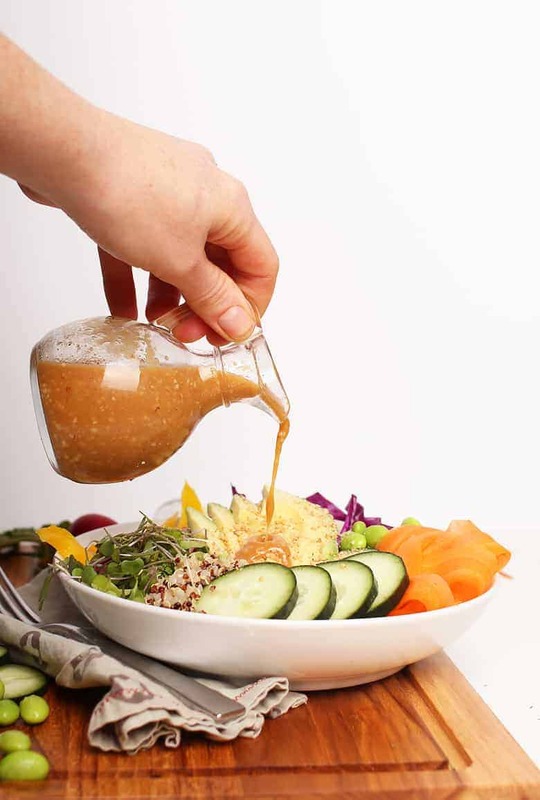 Dressings and sauces – Any good Buddha Bowl recipe is topped with a delicious homemade dressing. 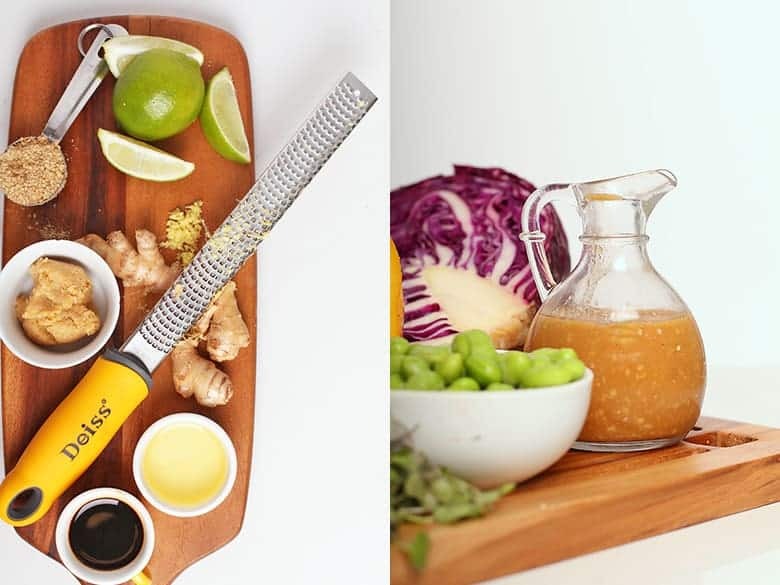 This can be anything from vegan ranch to tahini dressing to this simple Lemon Turmeric dressing pictures above. The dressing is a key component to the flavor direction you’re going with, so choose wisely! Nuts and seeds – For added taste and texture, nuts, seeds, hemp hearts, and herbs are tossed on top to give your Buddha Bowl recipe just a little more flavor and flair while pumping up the superfoods inside your one-bowl meal. Because it comes down to combining different components, there are endless combinations of vegetables, grains, and sauces. This means you can make a different Buddha Bowl every time! Get your inspiration from a variety of cuisines, featuring different seasonal vegetables, or make it all about the sauce. Not only are Buddha Bowls tasty, versatile, and colorful, they also contain some of the best food to put in your body. Buddha bowls are filled with whole foods that pack in the fiber, protein, vitamins and minerals, and superfoods you can handle. Buddha Bowls are also typically gluten free and vegan for a quick weeknight meal that everyone can enjoy. 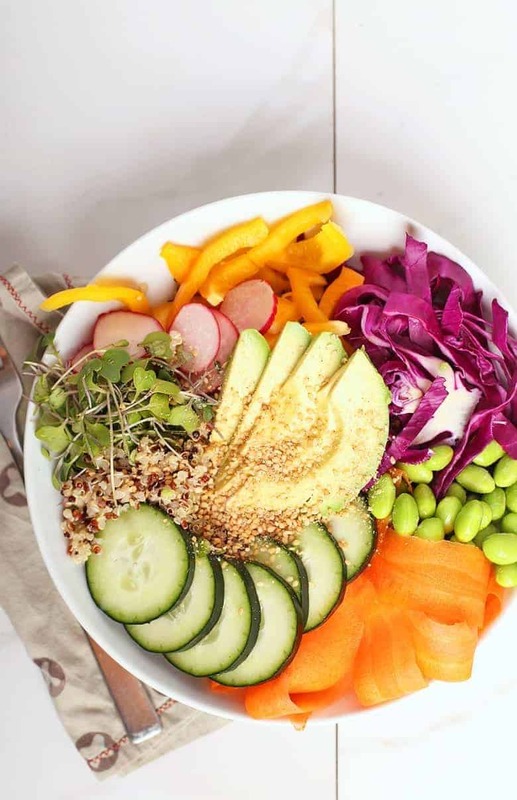 I think you’re going to love this Rainbow Buddha Bowl for all it’s fresh and bold flavors, delightfully crunchy textures, and wholesomely beneficial ingredients. Ready to give it a try yourself? Let’s take a look at the recipe below. 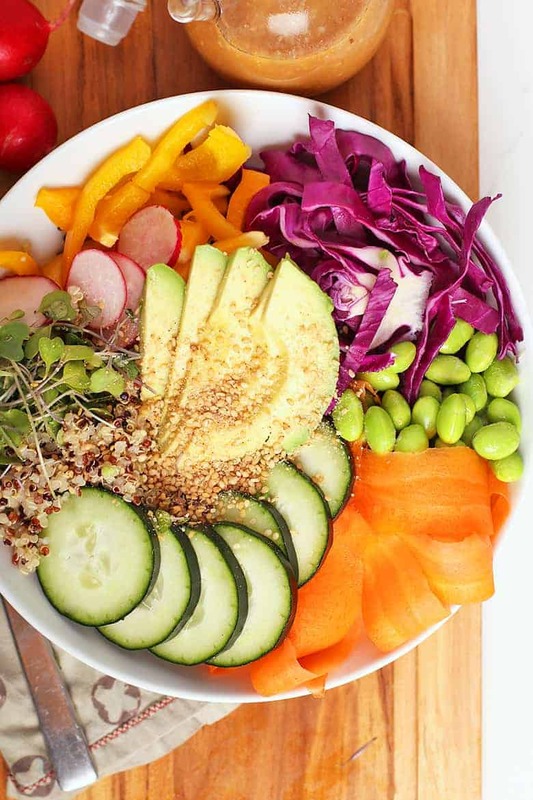 Brighten up with this Rainbow Buddha Bowl. Made with a base of quinoa, filled with vibrantly colored vegetables, and tossed in a Sesame Miso Dressing, this Buddha Bowl makes the perfect light and refreshing vegan and gluten-free meal. In a small bowl or salad dressing shaker combine all the ingredients for the dressing and shake vigorously until well combined. Place in the refrigerator until ready to use. Chop and prepare your vegetables. When quinoa is ready, divide between 4 bowls. Equally divide the vegetables between the bowls. Top with Sesame Miso dressing and serve immediately. Variation is the name of the game. Swap vegetables in and out as you please! Hi what exactly are micro greens? They are a type of green that is harvested shortly after they sprout (which is why they are small and nutrient-packed). You could also do any kind of greens, sprouts, or watercress if you can’t find microgreens.